1 drawing on paper ; image 4 x 6.875 in., on sheet 5 x 8.75 in. 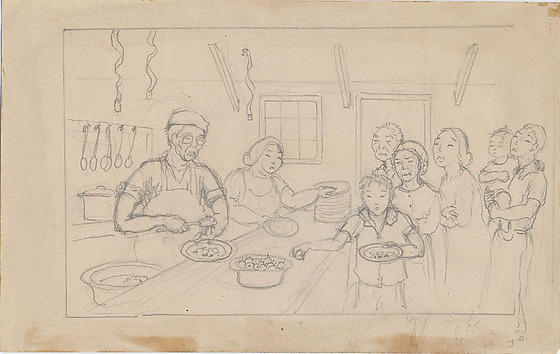 Pencil drawing of people waiting to be served food in mess hall cafeteria by kitchen workers behind counter within fine line rectangular border. Behind counter on left, a man wearing glasses, hat and apron scoops food onto a plate from a pot next to him ; woman in apron next to him pulls dishes from a stack beside her and places them on counter for him to fill. Across the counter a boy at front of line holds plate of food in his left hand and picks an apple from a bowl on counter with his right ; an elderly woman in bonnet, younger woman, elderly man, and woman carrying child stand in line behind boy. Doorway and window in background center ; pot and hanging ladles background left. Three curling strips of flypaper hang from ceiling. Similar to 94.195.22 and 94.195.24E.